After his extraordinary Bach pilgrimage, his Mendelssohn symphony cycle with the LSO, recorded forays into the likes of orchestral Rachmaninov, Janáček, Holst and even Grainger for DG, a wealth of opera in Lyon for Erato and Philips and a whole lot more besides, John Eliot Gardiner has once more gathered his loyal troops from the Monteverdi Choir and the English Baroque Soloists, and in effect come full circle to return whence he began, to Monteverdi himself. He has waited decades to record Il ritorno d’Ulisse in patria, having laid down the other two surviving operas, L’Orfeo and L’incoronazione di Poppea many moons ago for DG Archiv. In his typically urbane and expert note he discusses the huge world tour he made for the 450th anniversary of Monteverdi’s birth, an undertaking which involved semi-stagings of all three operas. It was decided to record Il Ritorno during the latter stages of the tour during the visit to Wrocław in Poland, and to take advantage of the exquisite acoustic of the National Forum of Music in that city. This superbly detailed account more than justifies this choice. My most recent experience of Monteverdi’s penultimate surviving opera involved a recent Erato DVD recording of a 2017 production from the Théâtre des Champs Elysées, featuring a star-studded cast and Emmanuelle Haim’s Le Concert d'Astrée. I was especially curious to see this production, because it involved Rolando Villazón and Magdalena Kožená as Ulysses and Penelope, even if it received decidedly mixed reviews. I rather enjoyed it. The singing and playing are of a pretty high order, the acting (which is difficult in what is a rather static affair dramatically) is OK, although the production itself seemed a tad dry. Listening to Gardiner’s recording a couple of days later was akin to experiencing the music completely anew. Inevitably there will be limitations in recording a live stage production but I found the sound of the Paris production to be somewhat dull and generic compared to the glowing, sun-drenched instrumental colours and textures that emerge in Gardiner’s fresh conception. It seems likely that this is down to some of the conductor’s decisions regarding the placement of the band in relation to the singers. In this regard he has taken his cue from Monteverdi’s contemporary, the composer and maestro di cappella at the court of the Medicis Marco da Gagliano. In his note Gardiner quotes him thus: “Be advised that the instruments which must accompany the solo voices should be situated in a position to look the actors in the face, so that hearing each other better they can proceed together.” Thus in this semi-staged concert performance, which toured 33 venues in eight countries, audiences were able to see the instrumentalists arranged in two symmetrical half-moons, interacting with the singers throughout the three acts (photographs in the booklet illustrate this arrangement). The effect of this for listeners at home is that the instrumental colours emerge with singular crispness and clarity; they provide an ever-changing kaleidoscopic backdrop for the voices and contribute to a recording of outstanding subtlety, richness and vitality. Another boon to this issue is the forensic clarity of the singers in their projection of the text. Gardiner’s cast seems a pretty international one, but the consistency and naturalness in their enunciation of the Italian text is a real joy. The language coach Matteo Dalle Fratte, whose role Gardiner describes at some length in the note, has clearly done a wonderful job. In terms of the singing, both principals seem perfectly cast. Furio Zanasi makes a valiant Ulysses, a strong-voiced baritone who combines dignity and jadedness, though there is little in the way of dramatic differentiation between Ulysses the absent king and Ulysses the disguised beggar. (Villazón received some lukewarm reviews for his performance in the production I referred to above, but I feel he carried off this aspect of the role rather well.) Lucile Richardot’s Penelope conveys cool, incisive beauty, and a steely world-weariness that intensifies as the opera proceeds. This characterisation certainly heightens the effect of the restrained duet with Ulysses that resolves the work; in my view it is perfectly weighted and meltingly beautiful. Seventeen principals are listed. Gardiner obviously thought long and hard about the casting, since seemingly there are no links that strike this reviewer at least as weak. His fastidious preparation and the repeated performances clearly helped both singers and instrumentalists fully inhabit their parts. Other standouts for me include the ripe soprano Hana Blažíková’s blazing, involved turn as Minerva, while Anna Dennis and Zachary Wilder are both ardent and likeably earthy as the lovers Melantho and Eurymachus. The pure-toned tenor Krystian Adam makes a fine Telemachus; his interactions with his father Ulysses are moving and convincing. I have always found the comic character Irus a rather contrived confection rather clumsily squeezed into the narrative. This was really apparent in the Paris performance where his scenes provide comic relief largely unrelated to what is happening around him. This mild irritation is of little import here, perhaps because one is merely listening to the music. Moreover, Gardiner’s Irus, Robert Burt, has subtler comic gifts than his Paris counterpart Jörg Schneider – his big monologue‘O dolor, o martir’ at the start of Act Three expertly combines over-the-top humour and pathos. There are relatively few choruses, but they each sound fabulous. I have always found L’Orfeo and L’Incoronazione di Poppea more musically satisfying and dramatically tauter than Il Ritorno, but not for the first time in my listening career Gardiner’s vision as well as his unparalleled ability to keep the show moving has challenged my long-held pre-conceptions. 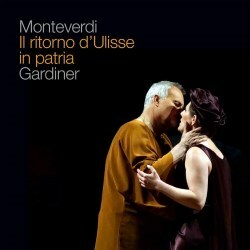 This is a beautifully performed, recorded and presented production of one of Monteverdi’s final masterpieces, and I look forward to revisiting it on many occasions. I wonder if Gardiner will now be persuaded to re-record the other two surviving operas. It would be fascinating to hear on disc the fresh insights the passing years will surely have afforded him.